Our product range includes a wide range of tri pack ryton tower packing ring and pdvf tri pack tower packing ring. We bring forth to our coveted customers this comprehensive range of Tri Pack Ryton Tower Packing Ring that has been designed as per the predefined standards of the industry. Customers can avail this range from us at the most comprehensive and market leading price range. 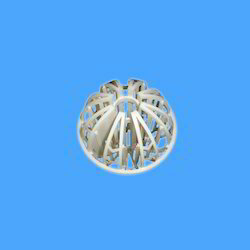 Perfectly sphere-shaped, this column packing is an intricate group of ribs and struts. Recognized by its geometrical shape this product offers good surface area to void space ratios. By the facilitation of continuous formation of droplets throughout the packed bed, this tri pack provides maximum surface contract between the gas and the scrubbing liquid resulting in high scrubbing efficiency, and minimum total packing depth required. PDVF Tri Pack Tower Packing Ring is a sphere shaped intricate group of ribs and struts. Its geometrical shape offers good surface area to void space ratio. The offered product has been widely appreciated for its high mass transfer rates due to its circular and consistent design of each packing. 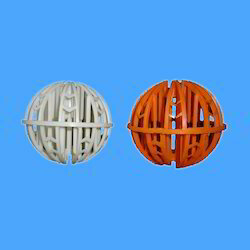 Basically this pack provides maximum surface contract between the gas and the scrubbing liquid by facilitation through continuous formation of droplets by the packed bed.